Don't let the sour grapes of Jonathan Miller dissuade you from acknowledging that David Tennant is a genuinely good actor. What he may lack in experience he more than makes up for with sheer charisma alone. It's obvious that a big percentage of this season's audience for Hamlet will be here by dint of 'that man from Doctor Who' and I bet the RSC are more than happy to see Shakespeare inspire a wider catchment. Miller confuses celebrity with talent. They aren't mutually exclusive, for sure, but you can certainly work out who has the talent and, frankly, who's simply interested in getting into the pages of Hello! magazine. Hamlet is a long play, exists in various forms, and is subject to cutting from any company that seeks to perform it. Director Gregory Doran gives us a three and a half hour epic, minimally staged to focus the audience on the performances and the story. The production is immaculately done and uses a huge set of revolving mirrored panels at the back of the set to allow actors to move from scene to scene and enable quick set changes. The mirrors also symbolically shine onto the audience itself much like the way Hamlet describes holding a mirror up to one's true nature. For me, the major point about Hamlet is whether the actor playing the part chooses one of two interpretations: he actually is mad or he's simply acting mad, whether he actually is that cruel to those that love him or he's just out to deceive his bete noir, Claudius, by any means necessary. Tennant handles much of Hamlet's 'madness' well. He's unrelentingly cruel to both Ophelia and his mother, Gertrude and Tennant is very steely when it comes to finally getting to the point. Which is good because Hamlet spends much of the play clouded by self-doubt and recrimination as to whether avenging himself on Claudius is the proper thing to do. The soliloquies are all present and correct and give due deference to Hamlet's inner turmoil. 'O, that this too too solid flesh would melt...' allows Tennant to try and strike the difference between 'good' and 'bad' Hamlets that any audience must get from the lead actor. This is melancholic Hamlet, despairing over the situation he finds himself in and is a lead into the later 'to be...or not to be' speech where he's got himself in such a tizzy that he's considering taking his own life. This is technically done very well, and naturalistically, by Tennant but my main criticism is of his tendency to then push the 'mad' Hamlet into the territory of comedy. 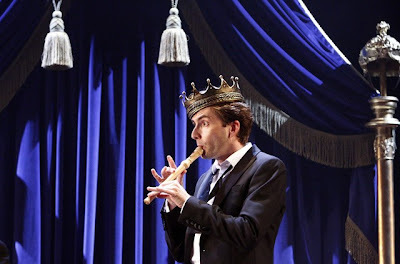 Even when Hamlet has inadvertently killed rambling old Polonius and Claudius and his Switzers have captured him with a view to packing him off to England to quietly assassinate him, Tennant is playing for broad laughs. Admittedly, he is very funny as only Tennant can be in 'charismatic charmer' mode. 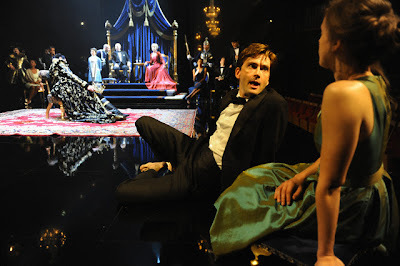 But, it dissolves the very real threat from Claudius and whereas another actor might let the audience know that Hamlet totally understands that threat I feel that Tennant didn't achieve that. There is a lack of clarity in the performance that left me unmoved at times. You should be at the end of your tether with Hamlet because he prevaricates where you want him to strike but then you must sympathise with his psychological ruminations too. The bluff of his madness should show his cleverness and humour not just what a bit of prat he is. Tennant had me disliking Hamlet for being a twit when I should be loving him for both his self-determination and morbidity. However, Tennant does manage to make him athletic, fast and powerful too which is exactly what a production like this needs. He may not have quite nailed the central performance but by golly he gives it masses of energy and carries the whole thing for three hours plus. 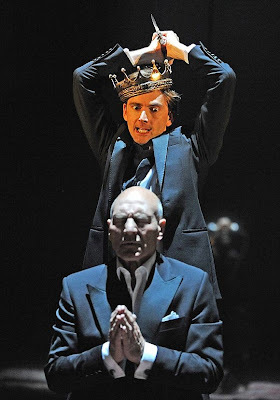 Patrick Stewart as Claudius is, for me, the real centre of the play. His dual role as the ghost of Hamlet's father also shows his real prowess. As the ghost he's unearthly and commanding. He is quite breathtaking in the way he turned Claudius into the Don Corleone of the Elsinore court. Sharp suited, velvet voiced but scheming and pernicious, he turned the King into a razor sharp manipulator of all those around him. His soft entreatments to Gertrude, use of Rosencrantz and Guildenstern and the various court diplomats provide you with the exact measure of him - a suave snake in the grass - and Stewart was perfection. There is a stunning lead up to the interval where Claudius finally reveals to the audience that he did do the dirty deed and murder Hamlet's father. Hamlet overhears and finally gets the courage to stab the murderer. Knife raised, crescendo of music and we're plunged into the interval waiting to find out if Hamlet has killed him. An unusual place to rest the narrative but quite effective. An old fashioned cliffhanger. The rest of the company carry off their parts with precision. Oliver Ford Davies is irritating and yet endearingly funny as the silly old codger Polonius, Penny Downie spirals from grand dame of the court to tragic, worn out victim as Gertrude and Mariah Gale was especially good as the doomed Ophelia and as a portrayal of true madness brought on by grief after the death of her father it showed Tennant's somewhat overly bombastic performance for what it was in some respects. Hauntingly sad, she encapsulated the real consequences of Hamlet's own avenging manipulations. It's a modernist, populist Hamlet to be sure with a very strong cast, elegant production and Gregory Doran's firm direction. It lacks much psychological depth - the clash between Hamlet and Gertrude in her bedroom abandons any Freudian reading and that's a mistake as it doesn't allow you to form connections between the way the male characters work with or against the female characters beyond the plot, especially the potential mirroring between Hamlet and Ophelia - and it energetically builds up the tension and yet allows it to fizzle out just when it should be at its peak in the duel between Hamlet and Laertes. Tennant's good but not great, Stewart towers over them all and fortunately three and a half hours does go by quite nippily. Images courtesy of Jamie Wallace. 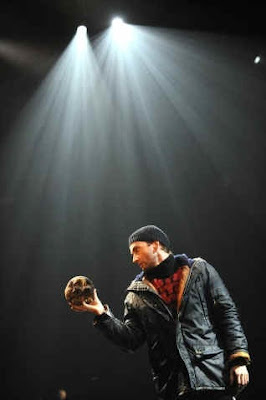 Hamlet - In rep until 23rd November at the RSC, Courtyard Theatre, Stratford-Upon-Avon. Transfers to the Novello Theatre, London from 3rd December. Booking for London opens to the public on 15th September.